Sarah has a strong family background in Gaelic games. Her grandad Paddy Jordan was on the last Mayo team to win the Sam Maguire so the quest for an All Ireland is in the blood. 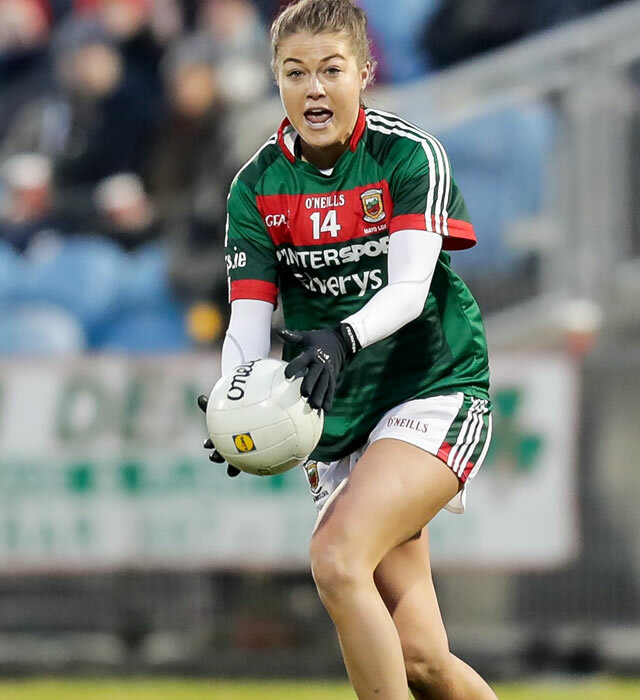 Her other grandad John Rowe played in an All Ireland minor final, both strong connections in sport that she is very proud of as she makes her own way with football-mad Mayo. “I was happy to be in at a young age, because my values of work and what didn’t work were established from a young age. These were established from watching the older players train and learning from them, playing from a young age was something I always wanted to do, I was coming in early and certainly it worked for me. I agree with players coming in early, you’re shown a lot of tough love in sport and you have to manage yourself and there are values you bring across to every aspect of your life so I think its good to get girls in early and get them trained up. Obviously with certain aspects of the game modified like gym work etc. Sarah also sees the value in the increased interest in the game and the wider profile it has gained in recent years. “You see with LIDL coming on board how much they raised the profile of the game and girls were suddenly getting recognised for the amount of time they were putting in. There seemed to be a bit more respect around the place and there were more people watching the game and they realised that it was of a good quality. The standard has improved with more sponsors getting on board and people are putting more effort in. It’s good that young girls have role models to look up to – when I was growing up you would have heard of one or two players like Diane O’Hora because she was from Ballina but you wouldn’t have heard as much about other players as there wasn’t as much exposure and marketing as there is now.